The Len'en Project (連縁Project / 鏈縁Project, lit. Connecting Chain) is a Japanese doujin game series that specialises in shoot 'em ups by Trick Nostalgie, whose sole member is game developer JynX. The series is notable for taking heavy inspiration from the Touhou Project . As such, it is a series of 2D (with 3D background) vertically-scrolling danmaku shooting games. Although it takes inspiration from Touhou, the games are technically not fangames towards Touhou. It is set in a separate world which features an entirely new cast of characters, therefore having its own canonicity and plot. The Len'en Project is set in the land of Mugenri, containing humans and youkai alike. It is sealed away from the Outside World by a mysterious spiritual barrier called the Mugenri Barrier. Yabusame Houlen is the main protagonist, and together with their friend Tsubakura Enraku, they are youkai exterminators who solve incidents. They were employed by Tsurubami Senri, the Shinto priest of the Senri Shrine – currently the only shrine in Mugenri. Tsurubami spirited away humans from out of Mugenri to force them to replace their job and go on a holiday to the Outside World. In-game events are similar to the Touhou Project , except that it works more deeply with connecting the plot of all the games together. In Mugenri, incidents occur once in a while, where there's an event that affects all of Mugenri with an unknown cause at the time it occurs. Frequently, incidents are due to a person's whim or curiosity, and usually Yabusame (and on some cases others such as Tsubakura) would go to investigate it to then find and punish the perpetrator. Such incidents can exist from a range of heavy clouds in the sky to an outright war between two major factors. It appears that stage enemies will gain power from such events, leading to cases where a mere small-fry can defeat the protagonist. While the project involves characters interacting with each other and having humour added to it, the stories can get very serious and deep in lore. Brilliant Pagoda or Haze Castle especially has a lot of dialogue hinting to the amount of plot added to the series. "I have to create everything except for the title name from scratch." "My seniors would transfer all their rights to the content to me and no longer have any involvement whatsoever." That is, JynX must keep the current title "Len'en" (鏈縁) and work on the project by themself. Thus, Daijin passed full ownership of Len'en to JynX, and overtime the game's story, characters, settings, design, and everything with Len'en has been completely overhauled to how it is known today. Various bits of elements from the characters of Emergency Everyday still exist in some of the current characters of today. The kanji in its romanised form ("Len'en") has been officially used, such as in the term Len'en Series (Len'enシリーズ), or just "Len'en" by itself. The letter "l" used in the romaji is official, as shown in the .exe file names of the games (e.g. Le01.exe), even though it's more usual to use the letter "r" in romaji. The apostrophe is used to separate the two "syllables" because, in this case, it's ambiguous in romanisation. The romanised letters are "lenen", in which the Japanese hiragana is ambiguous to represent either "re (れ), n (ん), e (え), n (ん)" or "re (れ), ne (ね), n (ん)". The apostrophe is commonly used in romanisation when an ambiguity like this comes up. JynX usually uses the simpler-looking 連 in casual writing since Evanescent Existence rather than the complex-looking 鏈, which also reads as ren having the meaning "connect". On the fourth instalment Brilliant Pagoda or Haze Castle, this became official use in the title, replacing the complex version of the kanji. This was because it makes writing a lot easier and "it seems lighter". Due to this, each game has had an update to show the simpler-looking kanji, as well (e.g. 連縁无現里 over 鏈縁无現里). The origin to using the complex-looking kanji is from the Japanese title of Emergency Everyday before JynX had ownership of the project. According to the developer's blog, it's a "similar to a certain shrine maiden danmaku shooting game, but if you try it you may think it's pretty different... but it's really nothing more than a rip-off of Touhou"-type danmaku shooting game. JynX has stated that the Len'en Project is their way of paying respect to Touhou. The characters in this project are either human or youkai and take many references to the characters of the Touhou Project . A certain number of characters have names that are themed around birds, called "Bird's Name". The characters' genders are generally left ambiguous in the Len'en Project. It is likely that their genders will never be revealed, and that it's simply up to the player's interpretation. As such, this wiki uses gender-neutral words. There are many aspects of the Touhou Project that the Len'en Project, as a series based on Touhou, imitates and parodies. The gameplay, character drawings and the music are all similar to Touhou in early creations, but have branched into something more unique. However, there are things that are based on Touhou but which are unique in their own way. For example, while Touhou often uses the kanji fu (符) in many of it's spell card names, the spell cards in Len'en use the kanji hai (牌). These two kanji have more or less overlapping meanings, but fu is generally translated as "sign", whereas hai is more like "card". The difficulty and speed of danmaku, however, is notoriously harder, resembling the difficulty of the Seihou Project . In addition, in both series, characters' abilities are described in a way that intentionally sounds awkward or unnatural. In Touhou, characters' abilities are often described using the phrase teido no nouryoku (程度の能力) that roughly means "ability to the extent of ". Reimu Hakurei 's ability, for example, is "ability to the extent of flying" (空を飛ぶ程度の能力, sora wo tobu teido no nouryoku). Abilities in the Len'en Project are described in a similar manner, but with the phrase teki na nouryoku (的な能力) which roughly means "something like (ability)". For example, Yabusame's ability is "Something like crossing dimensions" (次元を超える的な能力, jigen wo koeru teki na nouryoku). The biggest inspiration from Touhou so far has to be Haiji Senri, who is known to use spell card patterns that are directly imitations of those from Touhou. 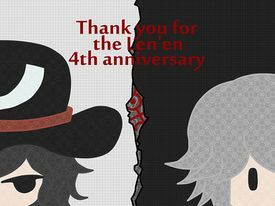 Every year, JynX celebrates Len'en's anniversary by drawing an illustration with dialogue (although there is no dialogue to the illustration for the 4th anniversary). Whenever JynX is asked about any direct connection between Len'en and Touhou, they say it's "up to your imagination". ↑ Len'en Series' Fourth Bullet: Heaven & Shadow War Record (Trial Version) Delivery Start! ↑ mugenri.blog.shinobi post "Original games "Len'en Mugenri & Len'en Tasouken" Trial version"
↑ mugenri.blog.shinobi post "2015 Original Game, "Connecting Link: Heaven & Shadow War Record"